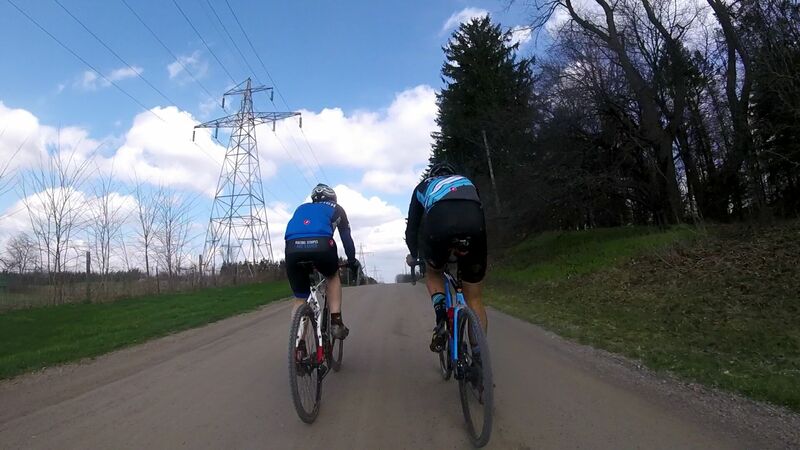 On Friday, I had the chance to head down to Ancaster and pre ride the last couple kilometers of the Paris to Ancaster course with some special guests. Raleigh Canada had set up the event and had invited representatives from Raleigh dealers to come out. Thankfully my boss thought this would be something I would enjoy and let me go to represent The Bike Zone. For all those racing Paris to Ancaster this weekend who were afraid that the course might be dry after a stretch of warm and dry weather, have no fears, there will be mud. Of course there is going to be mud, I don’t think those mud shoots will dry out before the end of May. In other course news, the last couple sections of rail trail, gravel road, and farmers field were dry and hard packed which should make for a fast race on Sunday. A number of pros, who will be racing on Sunday, were out for the pre ride. American cyclocross champion Jeremy Powers made an appearance on a very interesting bike that unfortunately I cannot tell you more about. Last year’s winner of the women’s race, Ellen Van Loy (Telenet-Fidea), and Christine Vardardos (Stevens) brought some Belgian flavour. Raleigh-Clement riders Jamey Driscoll and Caroline Mani were on hand to fly the Raleigh banner. Canadian national cyclocross champion Mical Dyck was also in attendance. 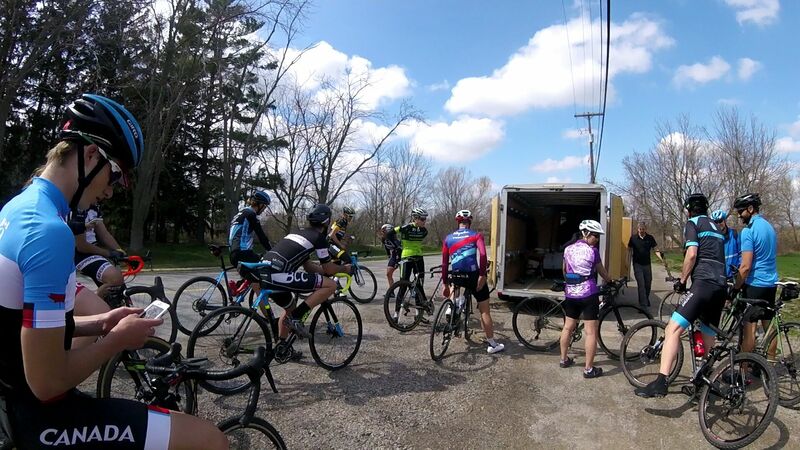 And some of the youngsters from the Canadian National Cyclocross team also joined in on the ride, as well as former United Healthcare rider and friend of The Wannabe Racer, Davide Frattini. Altogether, quite an illustrious group rolled out from the Morgan Firestone Arena to take in some of the gravel and mud on offer from Paris to Ancaster. 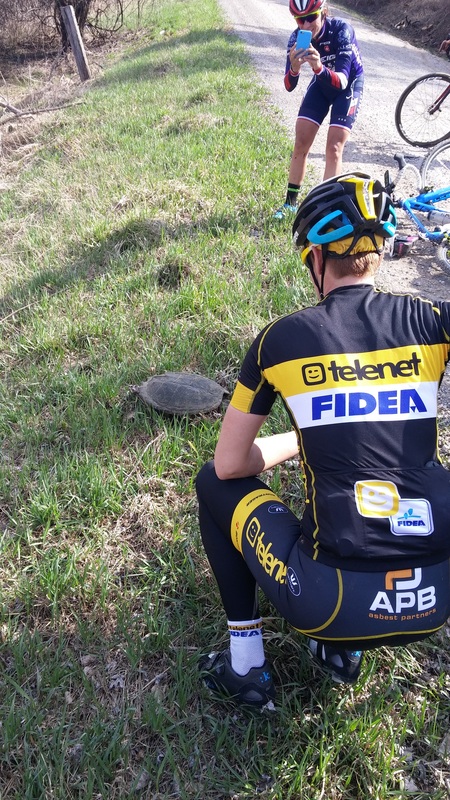 On route, we met a snapping turtle, that had just been removed from the middle of the road, and Ellen Van Loy had to be discouraged from getting too close in her attempts to get a picture with the turtle. Thankfully she listened and both Ellen and the turtle walked away okay. I am really hoping that I got all the bad luck out of the way for Sunday or this is going to be another miserable Paris to Ancaster. The first unfortunate event was getting a flat. I had, like an idiot, left my spare tube in the car. Thankfully, Jamey Driscoll (my new hero) came to the rescue and gave me a tube and a helping hand in repairing the flat. The second bad piece of luck of was crashing in one of the mud shoots. Looking back on the video, I was probably going a little too fast in pursuit of Jamey and Rodney from Raleigh and ended up in a raspberry bush before falling in the mud. I have plenty of scraps and couple bruises to remind me of the incident. As I said before, there will be mud on Sunday for the 23rd edition of Paris to Ancaster. The mud shoots we pre road had plenty of mud to keep you crazy mud loving hooligans happy. I totally forgot how hard the Martin Street climb is, a fitting finally to a truly difficult race. Rather than completely smoking myself on the pre ride, I had another nice walk up the hill. We’ll see how I feel after 69 kilometers of racing if I’ll ride up it on Sunday. The day wasn’t over after we wrapped up the pre ride. 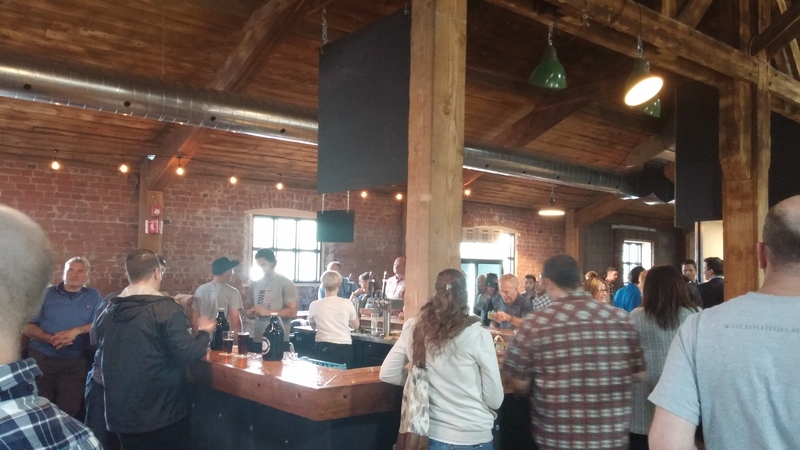 Next we headed down to Dundas to the Shawn and Ed Brewery for dinner and some beers. The beer was good and so was the food with a menu definitely designed for cyclists (carbs, carbs, and more carbs, oh, and some spicy chocolate). Watching the pros heap their plates with salad and listening to their dinner conversations made for some good entertainment before grabbing an espresso and doing my best not to fan boy. We were also joined at dinner by members of JAM Fund Cycling, “brotato chip” and 2014 Paris to Ancaster winner Anthony Clark, and Canadian cyclocross racer Aaron Schooler. Thankfully Davide was on hand to make things less awkward and introduce me to Jeremy Powers. I am a big fan of JPow and was really looking forward to having the opportunity to meet him this weekend. 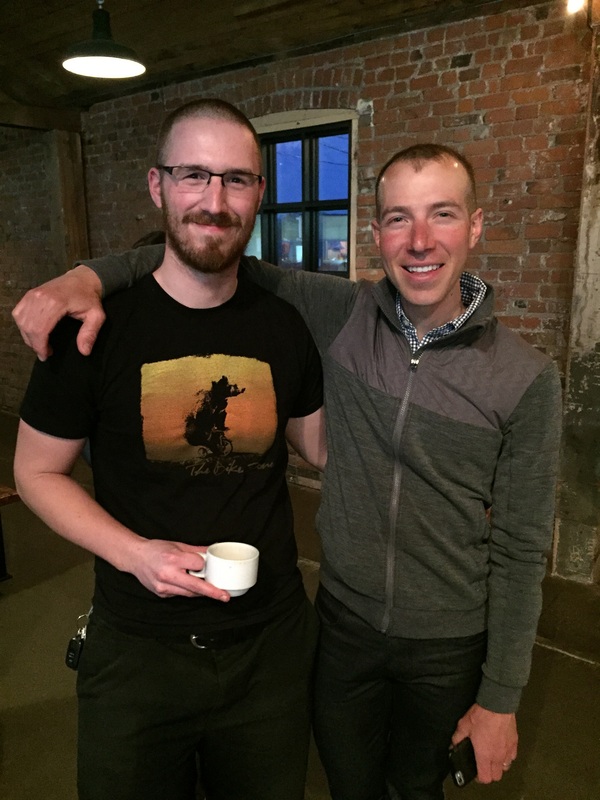 He was super cool to talk to and I was definitely not disappointed to meet on of my favorite cyclists. New BFFs? It was a fantastic day on the bike, despite some bad luck, and a great evening. Thanks to Raleigh for letting me come out and thanks to all the pros for being so cool. Now bring on Sunday.